A few weeks ago, Josh made me a happy lady. Wanna know why? He took me on a date to Ikea! And I think he might have even had some fun himself. Amazing! We got a few different things, like curtains, some kitchen gadgets and best of all, we got a coffee table…We’re moving up in the world! In order to keep this table looking brand spankin’ new, I decided to make some coasters to protect the finish. I searched through the interwebs and found a great tutorial to make “criss-cross coasters” over here. I’ve seen these made before and have always wanted to try my hand at them. I’m not gonna lie, I’m still pretty much a rookie when it comes to sewing. A year ago or so, my Mom bought me a simple Singer sewing machine (Really, it’s called the Simple model…haha. Made specifically for dumb dumbs like me), but I haven’t used it too much. Mostly because I’ve been lazy busy. But, that will be changing!! I’ve recently realized the potential in owning a sewing machine (mostly because it saves $) and I’ve vowed that I’ll start using it more often. Call it an early August resolution. Or a sew-piphany. Ok, ok…I’ll stop. With that being said, I dug some scrap fabric out of my stash and dove right into the project! 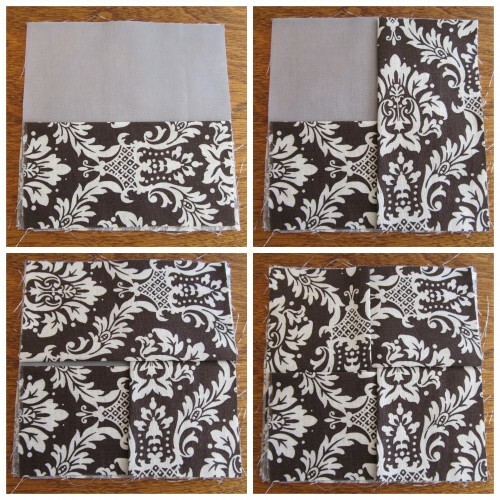 I used some leftover damask fabric from our wedding. The tutorial uses fabric with different patterns, but for this first attempt, I decided to stick with the same pattern/color on each one to hide any potential imperfections. I know you’re just dying to see exactly how I made these, right?! Well, here ya go. In 7 easy steps, you’ll be able to whip these up in no time! 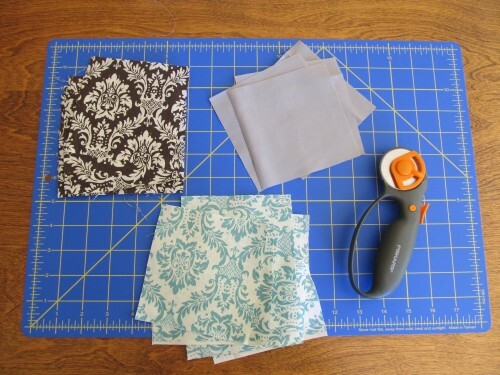 Step 1: For each coaster, cut out six 4.5″ x 4.5″ squares of cotton fabric. Choose four for the top, one for the inside and one for the bottom. 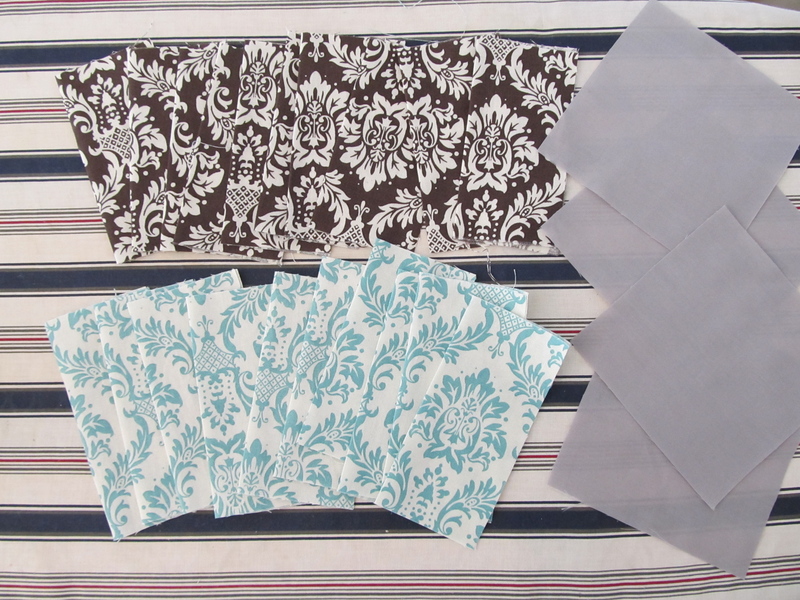 I did the four top ones and the inside out of the damask fabric and then the bottom out of a solid grey cotton. **The original tutorial suggests that you use fusible webbing between the bottom layer and the inside layer, but I skipped that part because, well, I’m not sure. I didn’t really think it was necessary, and turns out it wasn’t! You could use it to add some stiffness to the coasters, but they’re A-okay without it. Step 2: Fold and iron your four top pieces so that they are creased exactly in half. Step 3: Start stacking your pieces. Begin by placing the inside liner face down (not shown- but trust me, it’s under the grey piece!) 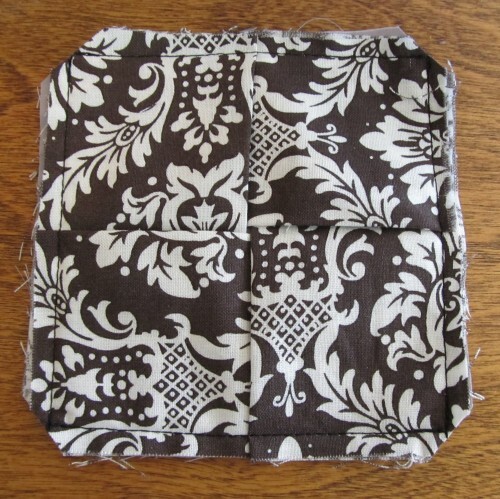 Then stack the piece that will serve as your bottom (the grey square in my case) on top of that. 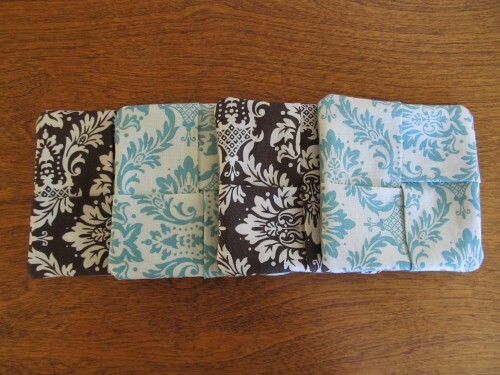 After that, start layering your folded pieces on top, making sure your raw edges face outwards. Layer your pieces, making sure that half of your last one is tucked under your first one (think of it like folding the flaps of a cardboard box). 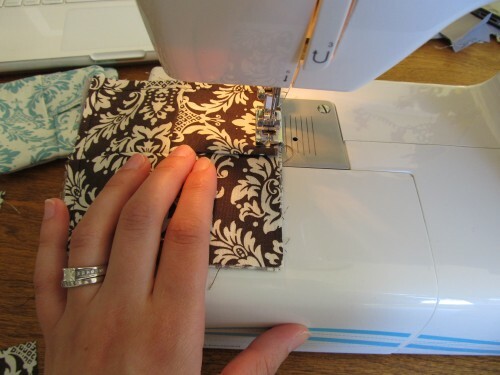 Step 4: Carefully pick up your stack and sew around the entire thing about 1/4″ from the edge. Step 5: Once you have your seam around the perimeter, snip off the corners (making sure not to cut your seams). 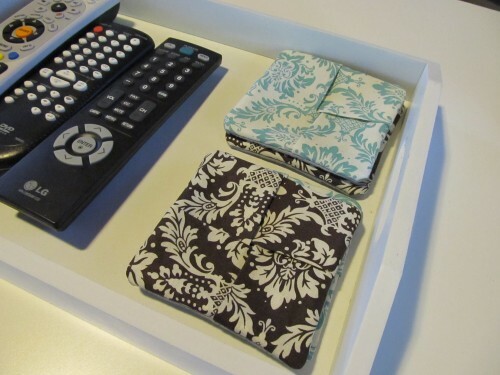 This will make your corners look much more square. Step 6: It’ll take some finagling, but turn the entire thing inside out. 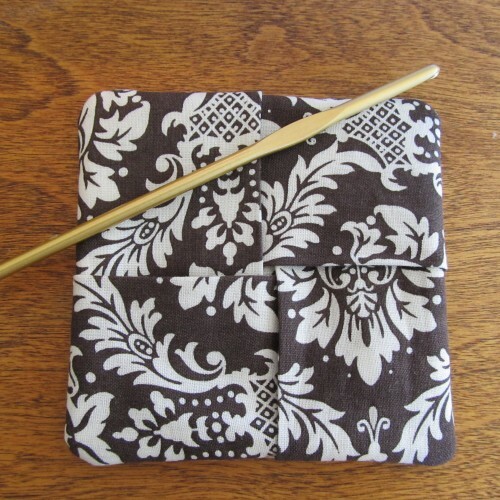 Use a crochet needle, chop stick, or whatever your preferred pointy object is to push out the corners of the square. so cute! You could do a set for the seasons/holidays as well. Love it!